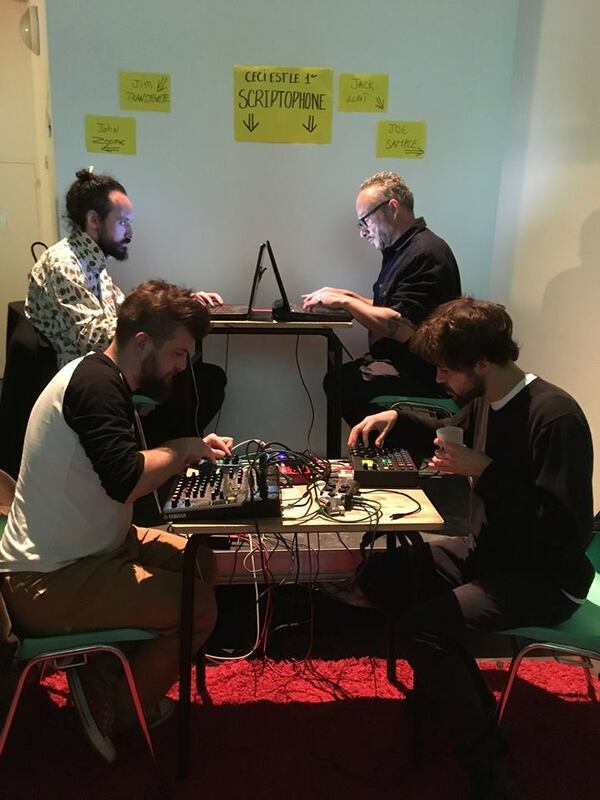 The "scriptophone" is a live performance concept that took place for the first time in Databit.me, Arles 2018, by Franco Mannara, Yann van der Cruyssen, Benjamin Efrati and Antonin Ferret. The idea was to generate text and music out of a single data pipeline : - A someone types text. - Someone receives the text input as MIDI data and turns it into sounds. - Someone samples chunks of audio from those sounds on a synchronized device. - Someone applies chains of effects and mixes the final signal. - The text was also printed on sceen, sometimes recited out loud and eventually printed on a thermal printer as it disappeared from the screen. Source code here (also includes a timer for creative instructions inspired by Brian Eno's Oblique Strategies).